I got this in the mail yesterday. I am not a big Flyers fan but I was hoping they would go to the cup finals. Meh.. not all wishes come true lol. What I found interesting about this card was what was written on the back. In the last decade of card collecting, i have found very few reasons to flip the card over and read the liner notes. However for some reason, I chose to read this one. I got a great laugh and really appreciated the efforts of Panini to include this liner note. Take a read and enjoy! I surely did. Thumbs up Panini!! Also a personal note to Zac. 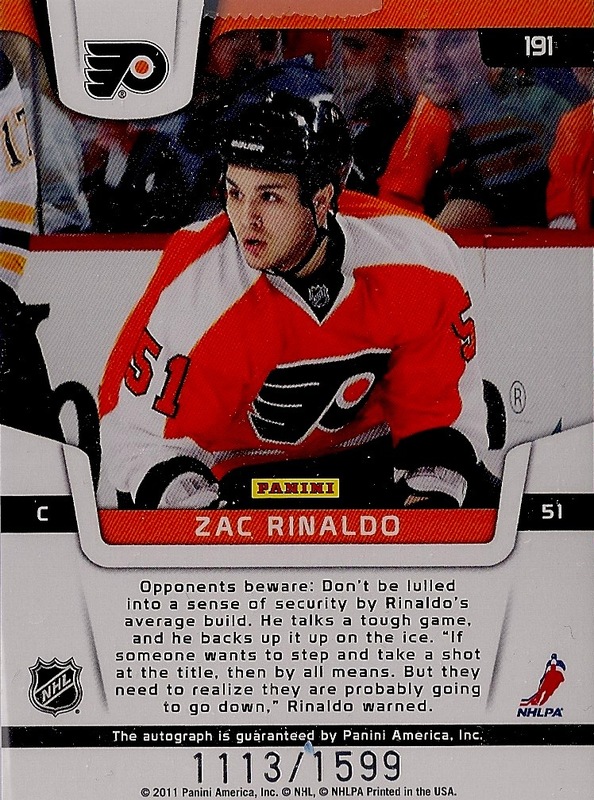 You are a total upgrade on Dan Carcillo.. never liked that guy.. Sorry Daniel..